﻿﻿ Integrated training systems for specialists in the oil-and-gas industry – ООО НПП "АТП"
At present, despite great achievements in the area of automation systems, it is impossible to completely rule out a human from the processes of management, control and maintenance in hazardous oil-and-gas production sites or facilities. Consequently, it is impossible to exclude errors leading to emergencies and accidents. Up to now in the practices of working with personnel involved in the oil-and-gas industry, scrupulous personnel selection and material incentives have been the main resources used to reduce the negative impact of the human factor on the industrial safety and security level. Personnel screening allows not only to eliminate those who are professionally unfit, but also to level out the drawbacks resulting from the general educational system. To date these resources, however, have come to the point of being exhausted. This tendency is characteristic of practically all industrially developed countries. According to the international committee (IOGCC) data, the average statistical age of a person employed in the oil and gas industry and in the service companies in the USA is 46 – 49 years. The average retirement age for the industry is 55 years. Today approximately 1,700 students are majoring in oil field development in seventeen US universities as compared to over 11,000 students in 34 universities in 1993. In 1998 a drop in oil prices caused to reduce or temporarily stop professional personnel training. It was also the reason why thousands of employees were discharged, especially those with a long and good record of service / seniority. They were no longer needed. Now the industry has to pay for the management shortsightedness. Top management thought little of the importance of human resources. They did not think it was necessary to show respect for and save the human resources. Of no less importance is a decrease in the young people’s interest in the industry due to a certain negative “environment polluters” label stuck to the modern power engineering industry which is becoming more and more aggravated because of the never-ending discussions about “greenhouse gases” and the disaster in the Gulf of Mexico. This is exactly why the problem the industry has come face to face with is so grave. There is a worldwide “brain drain” threat because thousands of engineers and employees will leave their jobs without being replaced by fresh workforce. Under the conditions of limited choice of personnel it is inevitable that the personnel quality is falling down below average. That is why more experienced specialist professionals are of an utmost significance, since they have many years of really effective training experience on-site. Such an approach to professional education, however, i.e. inefficient training, on the one hand, and efficient practice on-site, on the other hand, has a considerable shortcoming: it fails to effectively train and prepare personnel for handling non-standard and emergency situations, because no one in his right mind will intentionally run the risk of compromising complex and sophisticated process equipment for the sake of training students. As new equipment is becoming more and more complex, it is actually most unlikely that people can successfully learn on-site how to handle it in the course of practical work only. Practical experience shows that this shortcoming can be remedied by using training simulators, which imitate technological processes, including non-standard and emergency situations. This being the case, training simulators are still far from being implemented into personnel training practice in every potentially hazardous site. One can feel a certain lack of trust in such training practices on the part of top management. The reason behind it is no positive assurance that such rather expensive equipment will be used effectively from the viewpoint of ensuring a real increase in the industrial safety level. 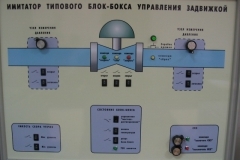 It is hard to criticize this point of view, since at present there are no strict methods to make an a priori assessment of efficiency at the training simulator design and development stage for training personnel for hazardous production sites or facilities, and likewise there are no methods to assess the expediency of these or other functions of training. Usually the data provided shows the emergency and accident situations, in which case it is implied that any trainee who has completed a course of training on any training simulator, will necessarily succeed in properly responding to and preventing an emergency or accident. At the same time, there are no assessments of the dependency of the efficiency on the training simulator functional capabilities, on the training time and on the trainee’s individual aptitude and capabilities. It is well known that for a correct application of statistics one needs a sufficient amount of numerical data and for accidents of the same type at that. The accidents and emergencies with the human factor being involved are rare and even unique, especially, if one looks deep into their causes, nature and sequence of specific events. Estimation of training simulator implementation efficiency based on the accident reduction statistics is rather impractical, because it fails to provide a way of evaluating different simulators in terms of their quality and functionality and thereby to improve the methods of conducting training sessions. This approach is called upon to persuade the top management to “cough up” for purchasing training simulators rather than to contribute to a real improvement in the industrial safety level. Research into the matter proves that the design and development of an efficient training simulator is often impossible due to a number of insurmountable obstacles, if there is no objective set to meet the requirements for a real increase in the industrial safety level. First of all, these difficulties are related to limited training time and limited financial resources, some trainees’ professional inaptitude and insufficient educational background. An operational switch-gear imitator, produced as a result of a long and expensive R&D program is almost useless for the tasks of industrial safety. Practically there is no analysis of the instructor’s tasks in the process of training and of the ways to find solutions to these tasks. Since there is no real decrease in the emergency and accident rate, it is easy in the long run to put the blame on “narrow-minded and unqualified” instructors and users of training simulators. Thus, lack of a constructive and scientifically substantiated approach to the estimation of efficient training sessions, and consequently, to simulator design projects for training personnel employed in the oil-and-gas industry is a serious handicap to the development of training equipment and hardware which can actually lead to a real increase in the industrial safety. Moreover, any ungrounded declarations of “efficiency” only serve to camouflage serious problems in implementing such equipment and training aids. 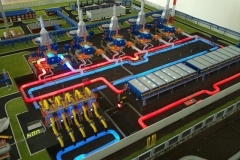 To get over the difficulties mentioned above, in a number of large Russian oil-and-gas companies, in particular, “OAO Gasprom” and “AK Transneft”, the development of new training simulators for a number of occupations, first of all for operators, is carried out in the category of the so called integrated training systems. Certain specific requirements are set for the equipment in such systems, and the whole complex is used to implement the so called optimum set of training sessions. The entire set of a specialist’s constructive activities (for instance, operator or dispatcher) or a chart of activities that is developed along with the development of the simulator equipment / hardware is divided into a number of episodes, actions to each of which a separate “training session” is devoted. Such training session charts combine the events, which do not depend on the trainee’s actions and which develop along a scenario of their own, and the events, which do depend on the trainee’s correct and incorrect actions. 1) assessment of preparedness level and personnel selection based on professional ability and aptitude. There is no point to use the existing training equipment to teach those who show no aptitude for being trained. In this case, it is not the results of a single test that are taken into account, but those of all the training sessions, which, on the basis of the error decrease dynamics, allow to automatically compute the estimated time of achieving error-free performance. The total training time needed for one trainee may be 40 hours, whereas it will take another trainee a year to do the same. The total time limit required to achieve the error-free performance level will actually be the criterion for personnel selection. It will be noted, however, that we will have to take into account the limitation inherent in this approach which is connected with the shortage of personnel mentioned above. 2) arrangement of additional training sessions during the period between retraining courses (for instance, 1 hour a week for one trainee) on the same training simulator, which is used for scheduled retraining, or on a simplified virtual PC-based training simulator version without trainees having to attend sessions in the training center. It will be noted that the system capable of ensuring the optimum set of training sessions (OSTS) is not sensitive to and does not depend on the instructor’s qualification, and it can in the long term work without the instructor, because a sequence of assignments is preprogrammed and the results of the entire training process are registered automatically. 3) training simulator ergonomics improvement. The training simulator in this case combines the trainee’s active work with real workstation interfaces (for instance, on touch-screen video display units) and the elements of ongoing process visualization which allow to get a more profound understanding of the processes and to have trainees master their skills to perfection and have trainees retain in their memory the knowledge they gained. Practical investigations based on the results of the integrated training system implementation provide evidence that technological processes should be displayed in a more graphically vivid form of 3D reality presentation with digitalized diagrams showing changes in parameters, and SCADA systems combined with interactive models and holograms working in a single computer network. Such “hyperreality” effects that demonstrably present space-time dependencies of technologies allow to get an in-depth understanding of the ongoing processes, and as a result to drastically reduce the total training time required to present one theme of training. Consequently, it is possible within a limited training time to cover a greater scope of material and objectively achieve greater efficiency factors in terms of the industrial safety. 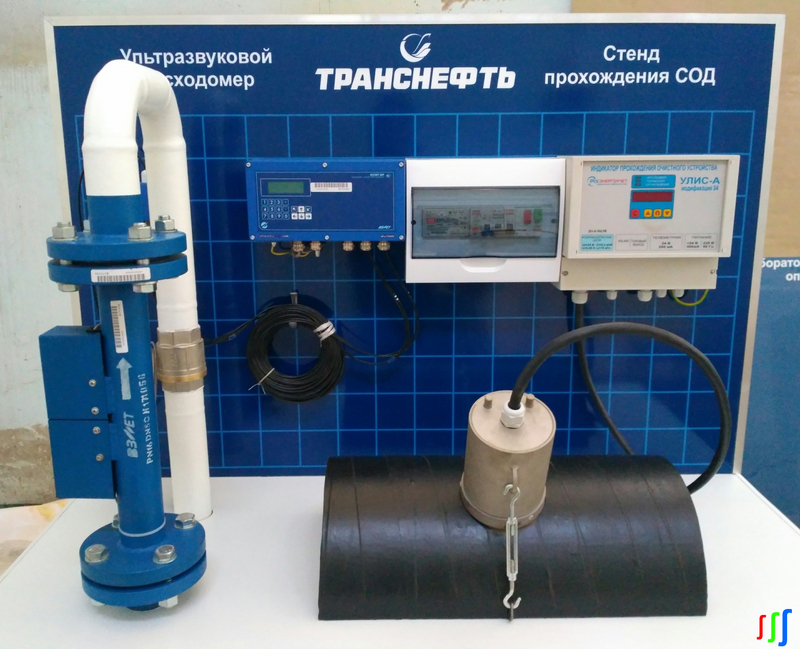 The integrated training system “Gas transport along a trunk pipeline” installed in one of the “OAO Gasprom” training centers is intended to ensure an improved level of industrial safety in running the gas production site equipment in normal and non-standard modes of operation. They use the software and hardware package that models the gas-dynamic parameters of a gas pipeline section equipment operation, including one or several compressor stations with several compressor workshops and a linear section and systems of automatic control and power supply to compressor stations. They also use a system that displays a microprocessor-based automatic control system similar to that operated on a real workplace. The purpose of building such systems is to carry out initial training of line production site operators, shift engineers and dispatchers, maintenance and service specialists, to have trainees develop skills in control and monitoring operations, to have trainees develop an understanding of the general character and peculiarities of the technological process. In addition, trainees acquire knowledge about possible non-standard and emergency situations, about the character of their progress, about how they manifest themselves, and about their consequences; trainees are taught how to behave correctly or respond to such situations when they occur; they also learn the strategy of how to have such a situation under control and how to reduce damage and recover from emergency situations. Trainees are taught to master their skills till they act automatically. This is especially important when trainees find themselves in emergency situations when decision should be made within limited time under the conditions of stress and uncertainty. The gas-dynamic model computes in real time all the technological parameters of the compressor workshop equipment and the production line equipment for each piece of equipment, including pressure, flow-rate, temperature, features of the equipment used. The trainee can interact with the model through the screens and panels which he or she can operate to bring about changes in the model operation. Some fragments of the interactive models are shown in Fig. 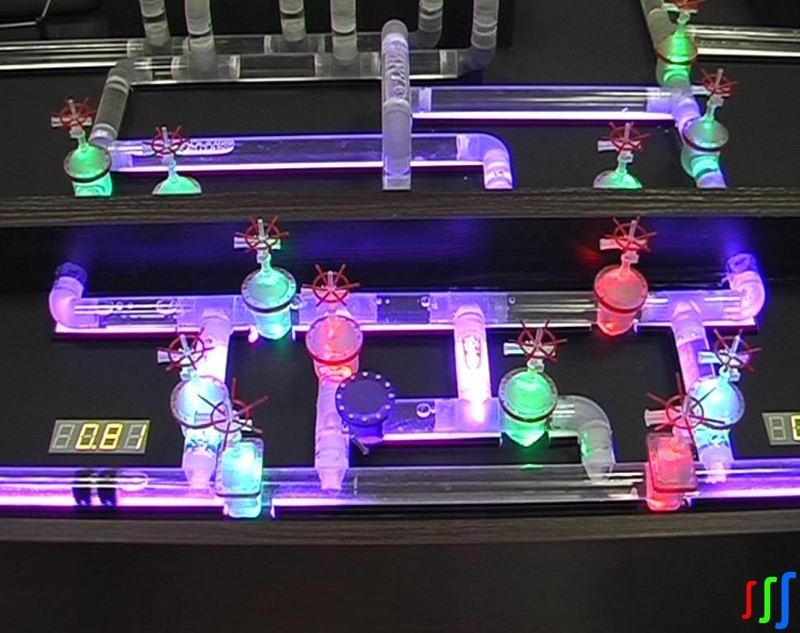 6 (these are working models with digitally processed elements lit up from inside, incorporated into a computer network). 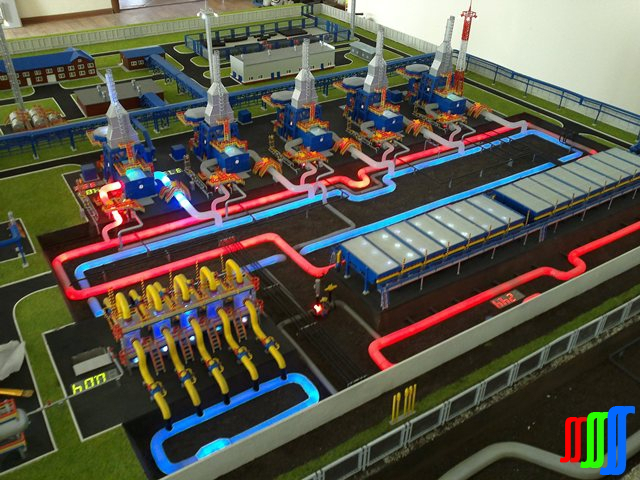 They are intended for training specialists of gas transport trunk pipelines, which operate under the control of a real model of a trunk pipeline section and are controlled by real shift engineer and dispatcher workstations. The workstations are implemented in the form of touch screen console panels (see Fig. 4). 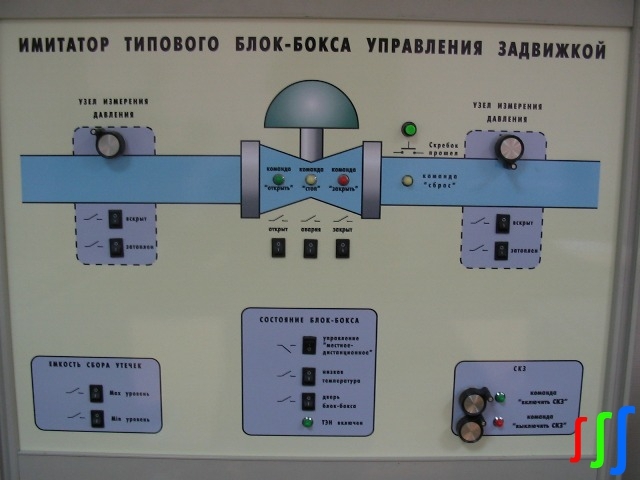 Apart from the fact that all the main technological processes relating to the control and operation of the gas transport trunk pipeline sites are located in one classroom, it is also possible to control real processes of a gas compressor station and at the same time display the ongoing processes on the screen and on the interactive model by using console panels (student trainee workstations) and the interactive whiteboard (the instructor workstation). The implemented elements of the optimum set of training sessions allow a trainee to acquire and develop skills in responding to and handling standard and non-standard situations and modes of operation. The microprocessor-based automatic control training simulators and the instrumentation workbenches for training repair service personnel are designed to provide the regulations and methods to maintain and repair automatic control systems, telemechanics and instrumentation equipment. A typical training simulator for repair service personnel includes real equipment of automatic control for gas pumping stations and instrumentation which is actually used on real sites. Also it incorporates the repair personnel workstations and the instructor workstation which allow to teach the principles of how to configure and program controllers. They provide for training in the environment used to develop controlling algorithms for controllers and in the SCADA system environment. The complex training system for electric power supply personnel is designed: 1) to train operating power supply personnel how to handle high-voltage switch-gear in normal and emergency modes of operation; 2) to train repair and maintenance service personnel what methods and techniques should be used to service, maintain and repair equipment. 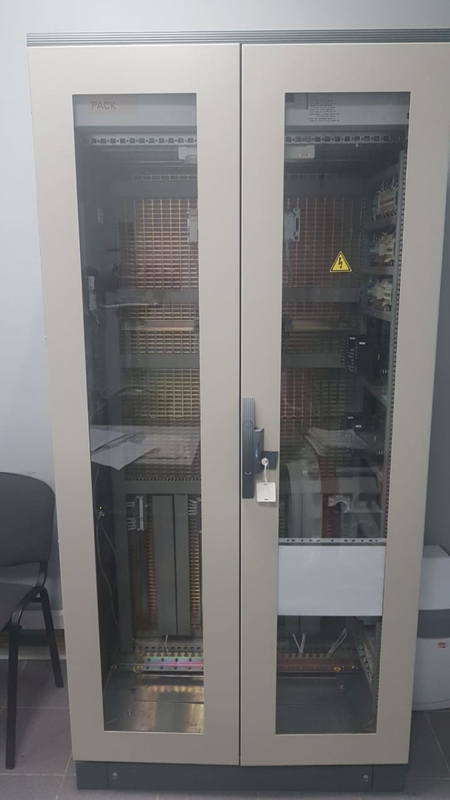 One of the distinctive features of the training simulator is a real electrical supply network emulator which provides the instructor with the option to physically set or preset real values of voltage, current, phase and frequency under the conditions of different loads, power consumers, breakdowns, emergencies and accidents, all of which are necessary for activating safety and protection system devices installed in real controller cabinets (АВВ SPAC, SE SEPAM, etc.) and for trainees to analyze the causes which made the protection systems trip, kick out, activate or deactivate the equipment being protected. The features of the training simulator are the following: it can handle controllers, change settings, preset values, control and actuate safety and protection devices, view oscillograms, operate real enclosed distributor devices, investigate group operation of control cabinets, handle intersectional switch-gear equipment, etc. 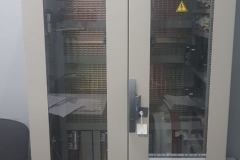 ; it can also monitor and control other related equipment, the arc safety devices, measuring equipment, transducers and converters, “automated energy workstations” with the basic functions of the automated commercial electric energy metering system and the automated technical electric energy metering system. 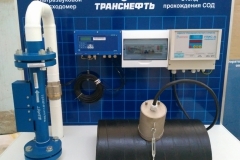 The “Oil transport trunk pipeline” integrated training system, installed on the initiative of the “AK Transneft” management in the Samara State Engineering University, is intended to teach students as well as to provide initial training, refresher courses and personnel retraining programs (Fig. 9). It differs from the traditional computer-based training simulators and 3D models in that it provides a dynamic technological process presentation of oil transport along trunk pipelines in full scope: equipment appearance, location as well as equipment current state are combined with the dispatcher workstation mnemonic diagrams and the automatic control system multimedia reference guides designed by using 3D simulation software and hardware packages. The whole system is based on the detailed mathematical model of the entire technological process which is represented in its full 3D scope. As the process is in progress, the equipment state and condition on the working model is changing which is highlighted by backlight colors, i.e. pieces of equipment are lit up from inside. Water is flowing through the miniature transparent pipelines, imitating in this way the real movement of oil through the system. 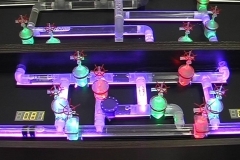 The circuits in which fluid is moving at a given moment are lit up from inside, actually showing the oil transfer process. The technological process system implements oil movement along the trunk pipeline section from one tank to another with one main oil pump station and two intermediate oil pump stations. This complex system allows a trainee to get involved in the production process from the very beginning, to familiarize himself or herself with equipment of various types, to intervene in the process from the operator’s real workplace. To make the picture more graphic, this operator workstation is purposefully located very close to the model for the trainee to be able to follow up and see the impact of his or her actions on the process. Apart from the visual effects a trainee receives the most important graphic information, i.e. how the process is going on, how equipment locations are spaced, and how all this is connected with the process dynamics. The virtual parameters that cannot be seen directly are shown in various graphs and diagrams displayed both on external screens and on the trainee’s workplace. Thus, training is carried out in this pattern: from the simple to the complex, from a general presentation of equipment and technology features to the principles of the automatic system control and operation, and up to the point of giving the trainee an opportunity to take part in complex response operations aimed at handling non-standard situations. At the same time, this complex integrated system allows to implement the principle of removing gaps in trainees’ skills and knowledge as trainees start training with different proficiency levels. This is why physical parameters can be directly measured by real sensors, and specific pieces of equipment can be investigated directly on test benches (see Fig. 10). This can be done even up to the point of implementing automatic control algorithms on real controllers. Such an option of allowing a trainee to “physically” intervene in the process is graphically reflected in the general system model. For instance, the workbench (see Fig. 12) can be used to show how an incorrect setting of a sensor or an incorrect mask set for protection devices in the automatic control system can result in the oil transfer process shutdown. Thus, in the same classroom it is possible to conduct general overview lectures for trainees of all occupations associated with the energy resources transport, using the model and the screen for illustrating this or other information; in doing so, different elements can be highlighted by a laser pointer, at the same time starting an auxiliary page with a 3D video clip, or a training system page. This allows the entire complex system to acquire the 3D model advantages: scalability, because the design and functionality of the dedicated complex equipment, for instance, the wave pressure level-out system (WPLS), with the help of the working model, can be visually perceived only to a certain depth, because the system on the model seems comparatively small from the distance of 1.5 – 2.0 meters. The 3D clip on the plasma screen called up by the laser pointer click on the LED located near the WPLS model can help go deeper into the system design and see in detail the impact it has on the process when used. Here it is possible to conduct in-depth practical sessions for specialists who service sophisticated measuring devices and automatic control equipment. One can have a chance to try and program controllers and perform experiments with various automatic control operation algorithms and immediately see the impact and results of those experiments on the working model, because it works in the same informational space under the control of the unified single mathematical model. The would-be engineers and dispatchers can be taught to control complex technological processes in real time in typical standard situations as well as under the conditions of artificially created stress in non-standard situations up to the point of investigating different system operation algorithms and the ergonomic impact of this or other interface on the perception and promptness of making decisions. Trainees themselves can take part in developing software applications, change algorithms and interfaces, as well as expand a technological process pattern, change the pipeline path profile, or even make a research into an altogether different system outside the system on the model, because the mathematical model constructor is open to users. To create and implement “training session charts” a dynamic (standard and emergency) situations generator has been designed for this particular purpose. It compiles and arranges single faults into dynamic chains of “fault trees” and at the same time allows to unfold the entire complex non-standard situation in space and time. The complex system described above is effectively used for training purposes thanks to the fact that the training process itself is more natural and friendly for a human; this process involves symbolic, spatial, audio and visual ways of perception. The trainee has an option to select a method of how to achieve the best desired results of acquiring information, to see, hear, or create a mental image in his or her mind as well as to take part (which is the most important thing) in handling such situations and to take such decisions as they require in order to develop an in-depth understanding, which otherwise will take years and years of actual work on a real site. There is an option to make errors, which are inadmissible on a real site. Prevention of such errors in future work is exactly the main purpose that these integrated training systems are designed to help attain.